At the end of the year, it’s fun to look back over our most popular antiques and decor blog posts of 2013. 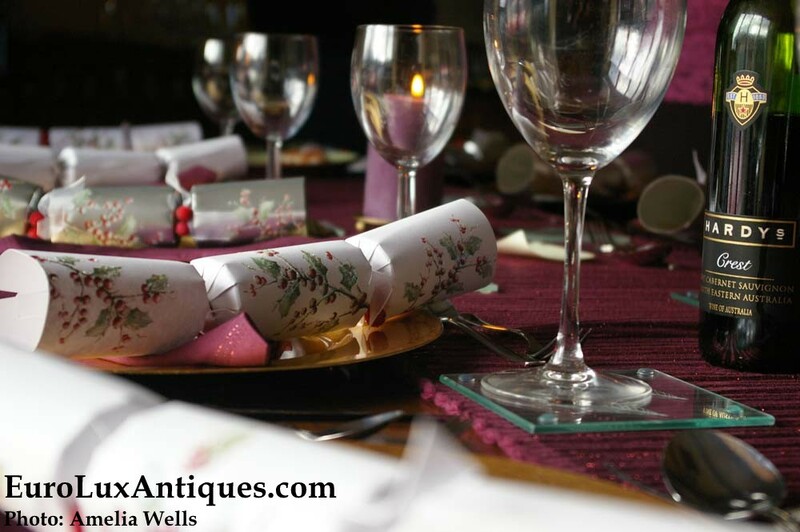 We hope you’ve found useful tips about antiques and vintage furniture and home decor accents. We’re especially grateful to our customers who shared their home photos with us all. Their stories are a great source of decor inspiration to readers who subscribe to the blog by email or who follow us on our Facebook page. We love seeing our readers’ and fans’ comments too! 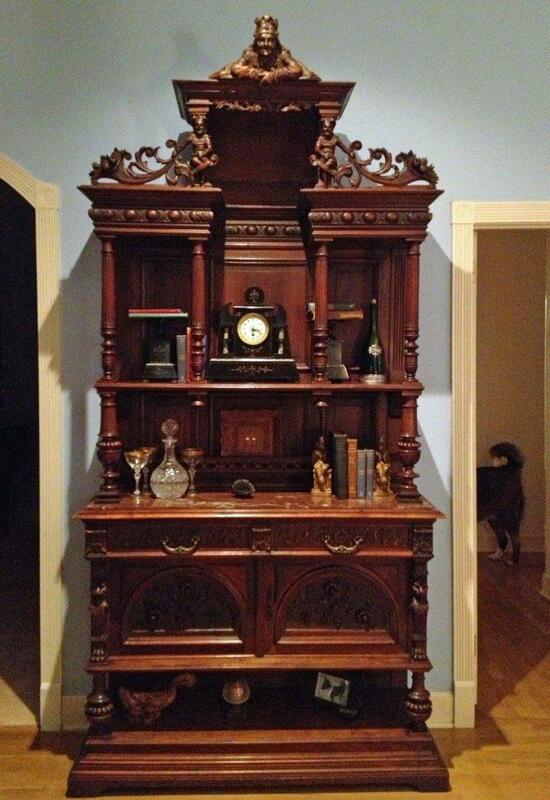 Here are the first of our (and your) favorite 12 antiques and decor blog posts of 2013. We’ll share the rest in our next post to welcome the new year! Inspired by an article in Oprah magazine about the home decor trend for mixing heavily carved antique furniture with contemporary furnishings, I wrote this post on heavily carved antique furniture. There are many different carved furniture styles, and the post showcased ways to blend carved furniture and accents into your home as unique pieces of hand-crafted history! I wrote about upcycled chandeliers after Tupelo Honey Cafe bought one from us for one of their new restaurants. 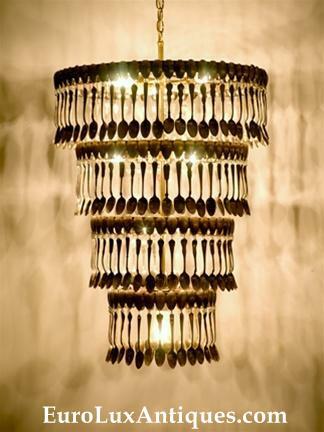 These unique light fixtures are custom-made for us by an artist. The chandelier for the restaurant was actually created out of a vintage tea service, and you can see photos of it and others in our gallery in the upcycled chandeliers post. It was one of our most popular blog posts on Pinterest – the photos got lots of repins from our Pinterest boards. Our client spotlights showing our customers’ homes always rank among our most popular antiques and decor posts! 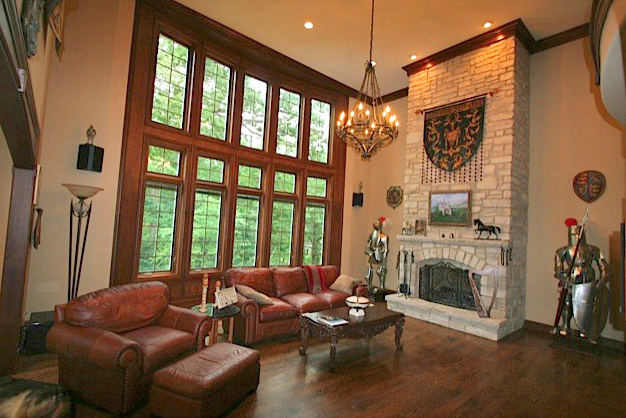 Bob H. in Illinois lives in a gorgeous French Renaissance chateau style home and we loved sharing his story. Our Renaissance Chairs in Chateau Home post shows how the antique furniture he bought from us blended with the amazing armor and other design details in Bob’s home. 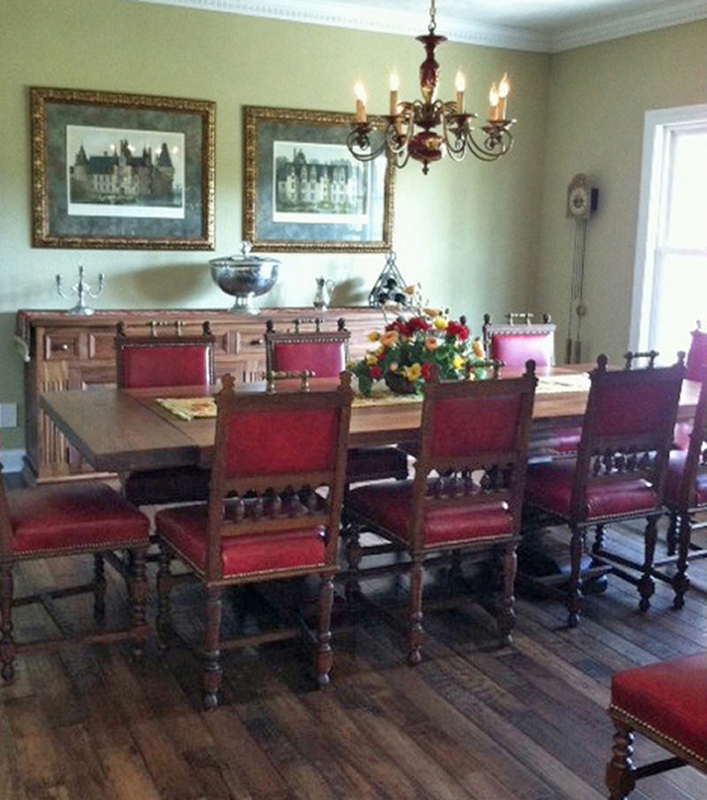 Susan D’s stunning red dining room inspired another popular client spotlight. 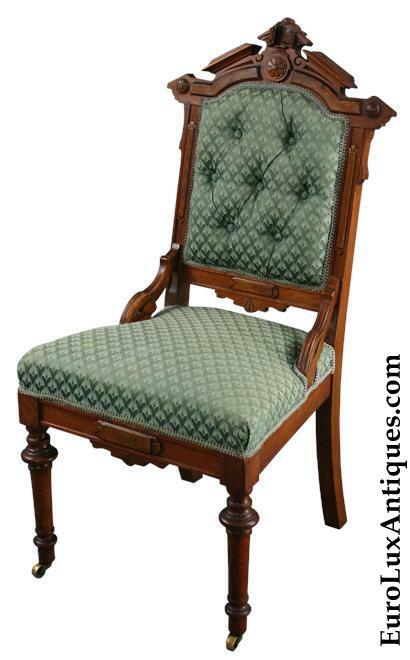 Susan bought a set of 12 antique dining room chairs from us dating to 1900 with lion carvings and metal handles. The sturdy oak frames were in great shape but some of the chairs needed an upholstery makeover. You can see the finished effect, complete with a vintage chandelier and other great decor details in our post on Susan’s Renaissance dining room. If the words “stained glass” remind you of old church windows – think again! Our post on stained glass in home decor showed how to enjoy the luminous color of stained glass in many delightful ways. Our related Dale Tiffany Lamps article explained how the Dale Tiffany lights we carry in our gallery are hand-crafted by glass artisans using traditional Louis Comfort Tiffany techniques, including a video of the artists at work! Browse the remaining six of our top 12 antiques and decor blog posts of 2013 at this link. We’d love to know which are your favorites! Meanwhile, everyone in the EuroLuxAntiques.com family wishes you a wonderful New Year! This entry was posted in Antique Furniture, Home Design Ideas and tagged Antique Furniture, interior decor, interior design, living with antiques, Renaissance Chairs on December 29, 2013 by admin. We’ve already shared some of our favorite recipes for Christmas cookies. Now we’ll make the house smell delicious with our homemade Christmas fragrance! 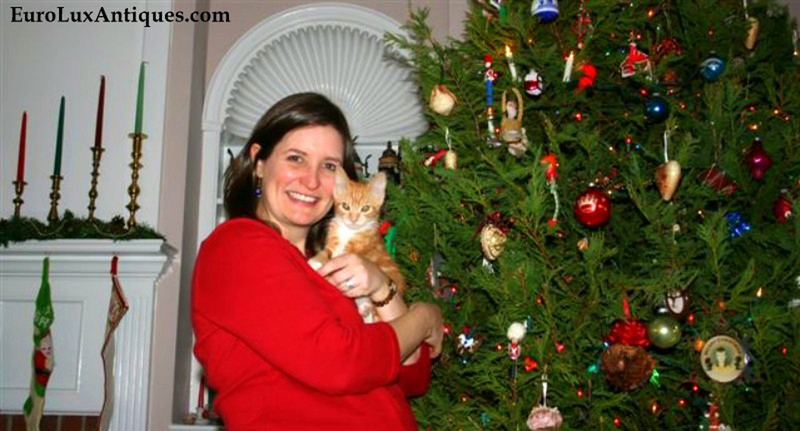 Greg’s mom Kathy loves having all of the family come home for Christmas. Greg’s sister, Laura, and her family moved to Ohio several years ago, so it is great to have everyone back in South Carolina for the week surrounding Christmas. They enjoy coming south to get out of the snow! 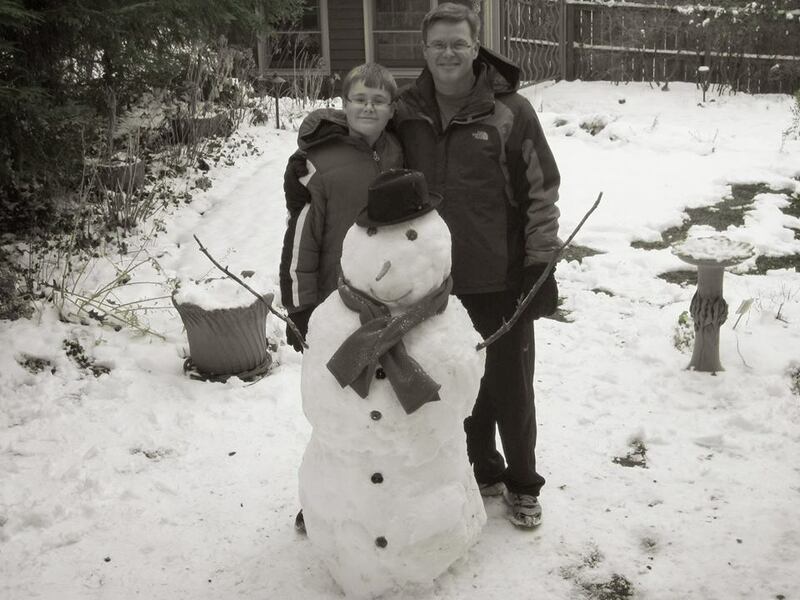 This is my brother-in-law, Mike, and my nephew, Matthew, with the snowman they made last week. We all love Kathy’s baking and she loves to bake – so it works out great! 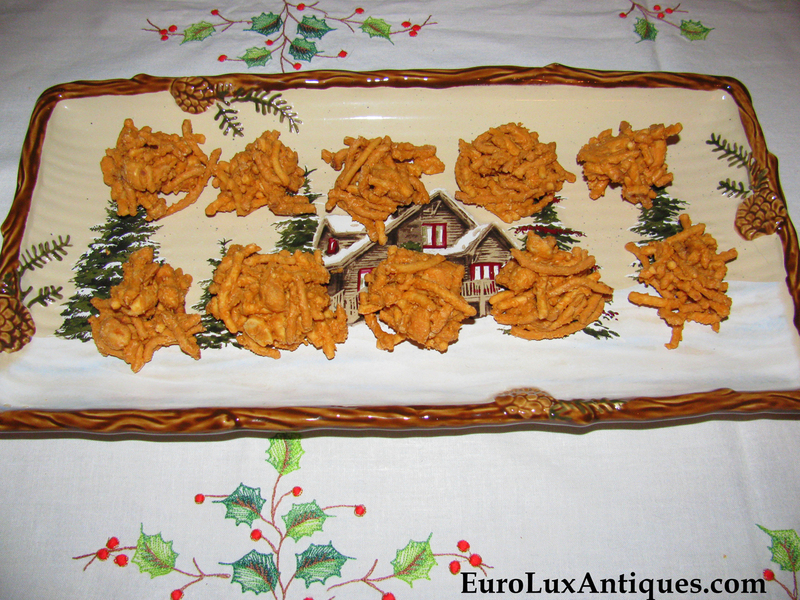 In addition to Kathy’s recipes for Christmas cookies that I blogged about before, Kathy also makes Haystacks with chow mein noodles and peanuts in melted butterscotch bits. They look so festive on her lovely platter. I readily admit – I am not much of a baker. I once made a “No Bake Strawberry Pie” for Greg. He took one bite and chokingly asked, “You didn’t bake the crust?” Nowhere in the stupid recipe did it say to bake the pie crust and the name of the recipe is “No Bake Strawberry Pie” – I rest my case! I haven’t attempted baking since. As there isn’t much chance of any cookies baking at my house, I do like to add our special homemade Christmas fragrance at this time of the year. 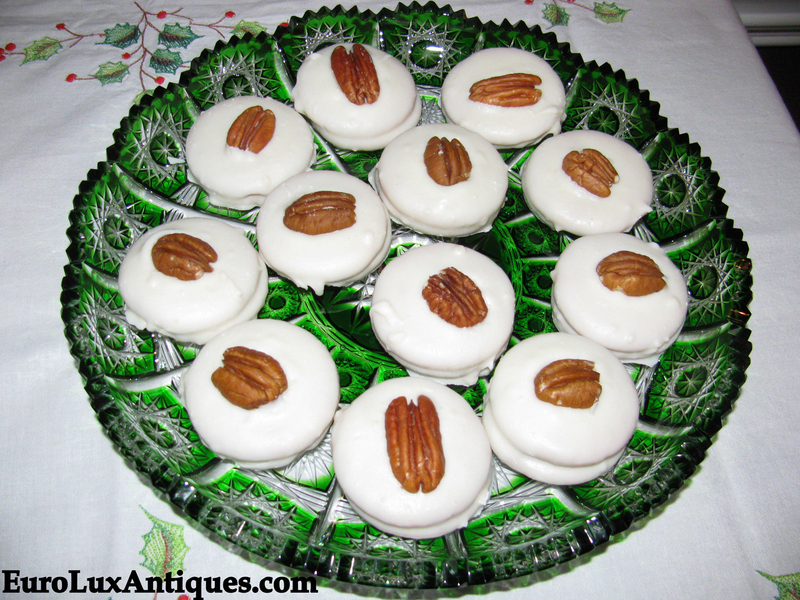 I learned this treat from Kathy – it is a wonderful way to make the house smell Christmas-y. Throw all the ingredients in a small pot and cover them with water. Simmer the blend gently on a back burner during the holidays to make the house smell good. Top up the water as needed! The homemade Christmas fragrance creates a festive holiday mood very quickly. The scent takes me back to some fond memories of Christmas past! Here’s a photo of me with Ozzie, affectionately known as Mr. Kittles, when he was a baby kitten a few years ago. We’re in front of the Christmas tree at Kathy’s house and I do love the way Kathy displays her red and green candles in vintage candlestick holders on the mantle. 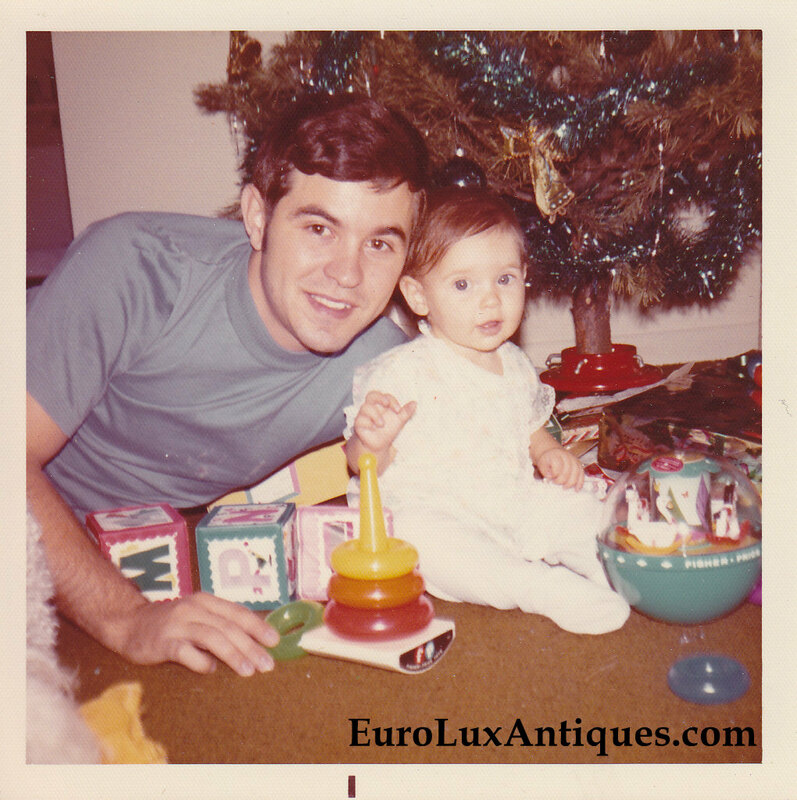 Going even further back to when I was a baby, here I am with my dad on my very first Christmas in 1971. Yep, I really wanted to get my hands on that stacking rings toy. But I’ll smile nicely at the camera if it means I can get to the goodies quicker! 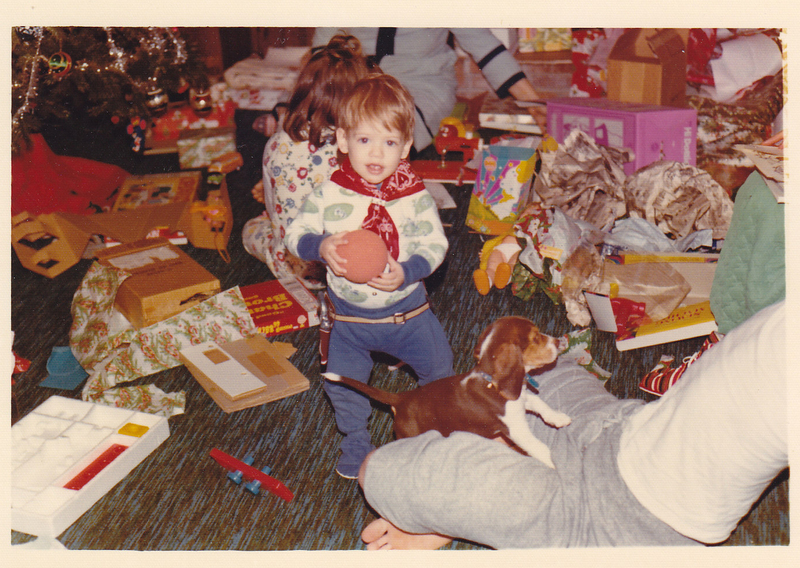 Here’s Greg at about 16 months old, opening presents in the middle of Christmas chaos. Any boy with a puppy, a ball, and a cowboy outfit has to be in seventh heaven, right? If you try our family’s homemade Christmas fragrance, I’d love to hear if you enjoy it! Tell us in the comments box below, or share your own favorite holiday scents. This entry was posted in Entertaining, Holiday Fun and tagged Christmas, creative home decorating, holiday, holiday decor, holiday decorating, holidays on December 19, 2013 by admin. I always love making the house festive for the holidays. Dreaming up new ideas for our Christmas table decorations is especially fun, and a great way to get into the holiday mood. I enjoyed browsing these creative Christmas table decorations, and I hope they will inspire your ho-ho-ho-holiday spirit too! 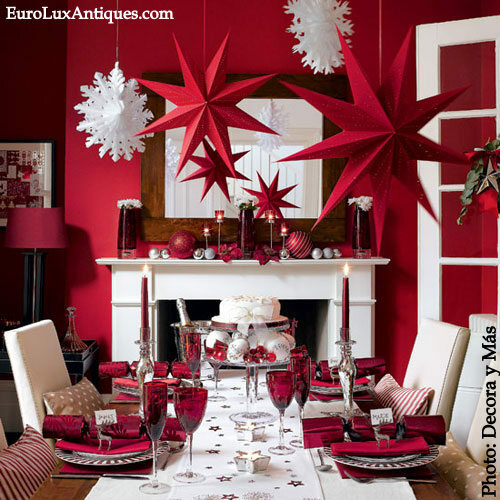 The rich burst of red is a seasonal tradition, but this Christmas table decoration design also packs an updated and elegant punch. The purity of red and white is made even more stunning with no other color to dilute its impact. But the stars hanging from the ceiling really make this arrangement stand out from the crowd. The stars are such a simple detail and easy to do, but they create a powerful impression and evoke images of the Nativity. This chic dining table setting has a hint of French flair about it! The silver, white, and navy color combination rings the changes from the more usual Christmas scheme of red and green. And the love birds theme is very sweet! 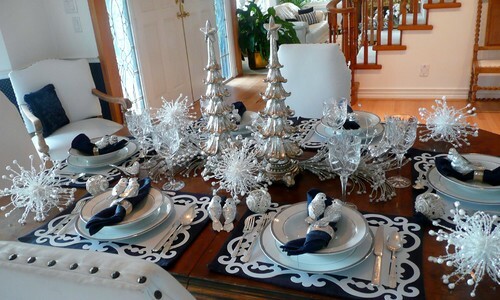 In a similar vein, this white and silver Christmas table decoration looks pristine and pretty. The setting stands out so elegantly because it is placed on a black or very dark brown table. 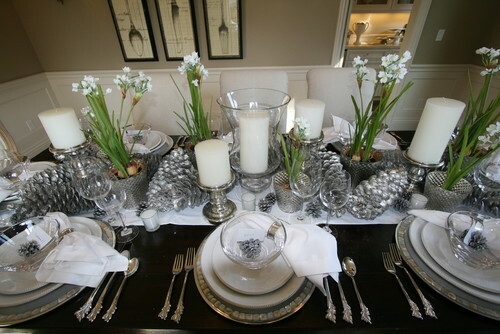 This makes the white table runner, flatware, candles, and napkins really pop! The setting itself is actually quite simple, but the silver-sprayed pine cones and tall white buds pull the whole look together. The flowers’ green stems add a lively note and prevent the table looking too stark. 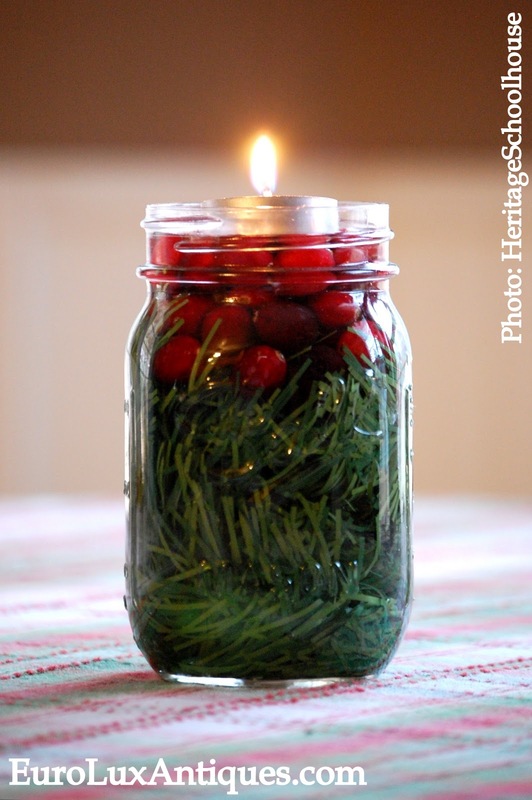 Finally, the homely mason jar is cleverly made into an attractive Christmas table decoration by the addition of some winter greenery layered with cranberries. The jar is filled with water and a floating tea light. It would make a striking centerpiece, and look great on a mantle too. 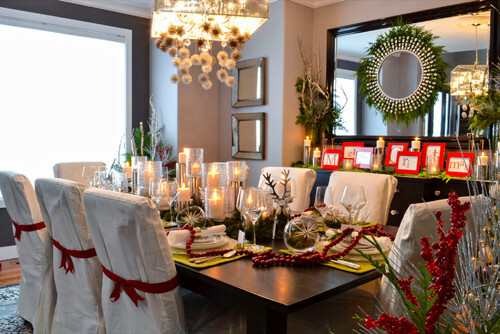 Or place a row down the middle of your holiday table and your decor job is complete! Also check out my previous post on how to fold a napkin into an orchid fold, which would look especially lovely on a Victorian Christmas table. If you have a favorite trick to make your holiday table sparkle, or any links to photos of Christmas table decorations that you love, tell us in the comment box below! This entry was posted in Entertaining, Holiday Fun and tagged Christmas, Christmas table, decorating with red, holiday, holiday decor, holiday decorating, holiday table, home decor on December 12, 2013 by admin. Greg and I aren’t taking an antiques buying trip to Europe during this holiday season because we’re too busy filling customer orders for gifts. But I love thinking about interesting Old World Christmas traditions – especially the food! It’s fascinating to see the different ways people in France, England, and Italy celebrate the holidays. While some of these Old World Christmas traditions are familiar to us too, at least in certain regions of the USA or Canada, others are less well-known. Did you know that instead of hanging up a stocking for Santa Claus, children in France often leave shoes out by the fireplace for le Père Noël to fill? Around the holidays, French bakeries are busy making Galette des Rois or King’s Cake. 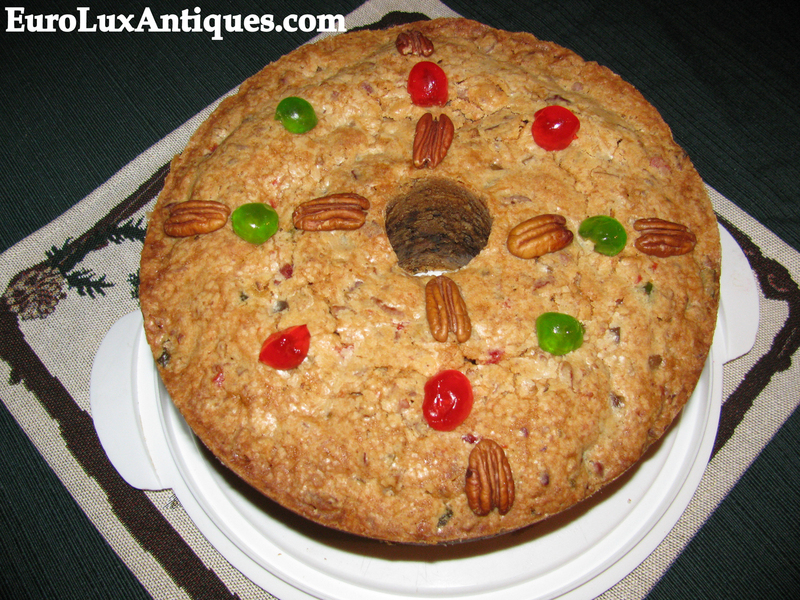 The puff pastry cake is filled with frangipane or almond paste to be enjoyed around Epiphany on January 6. That date is also known as Twelfth Night, to close the twelve days of Christmas. 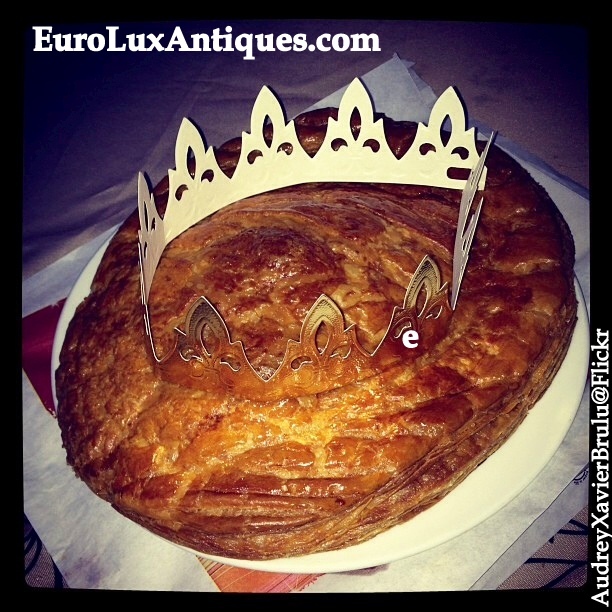 The Galette des Rois traditionally had a lucky bean hidden inside it. Over the centuries that changed to a little charm. If you are served the slice with the charm in it, then you are crowned King for the Day! 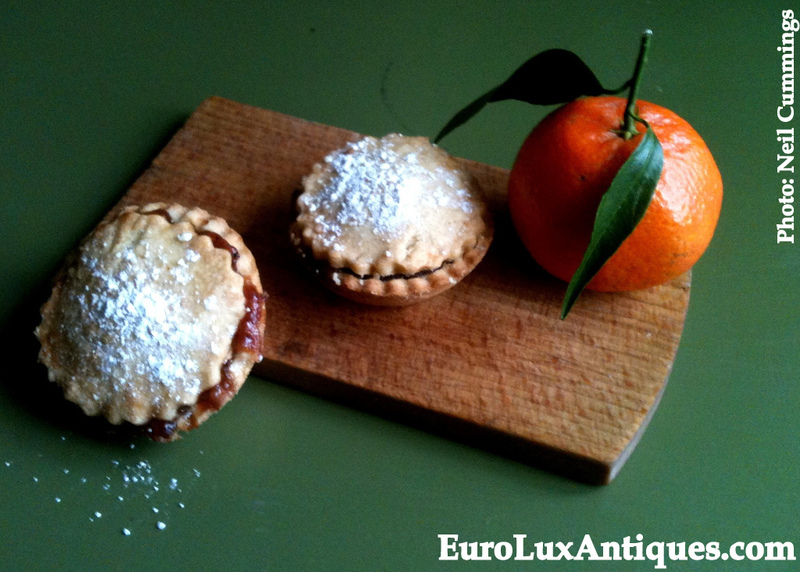 It isn’t an English Christmas without a plate of mince pies! The pies are filled with mincemeat — despite the savory-sounding name the tarts are actually a dessert treat. 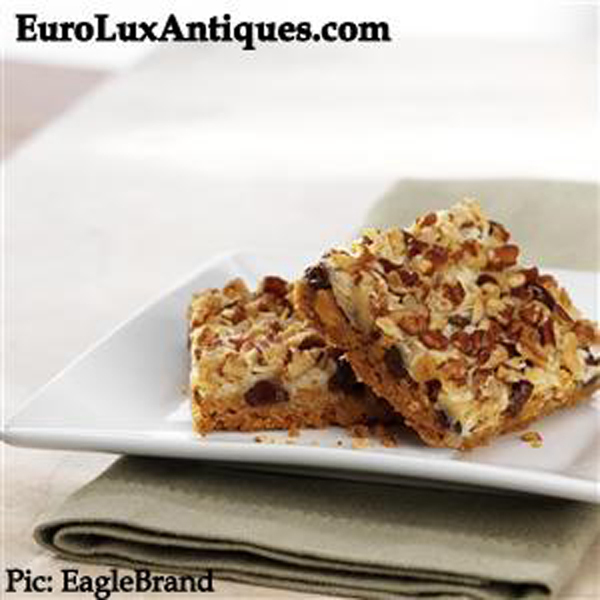 The mincemeat is a sweet blend of dried fruits, spices, and usually a hearty dash of brandy or rum. 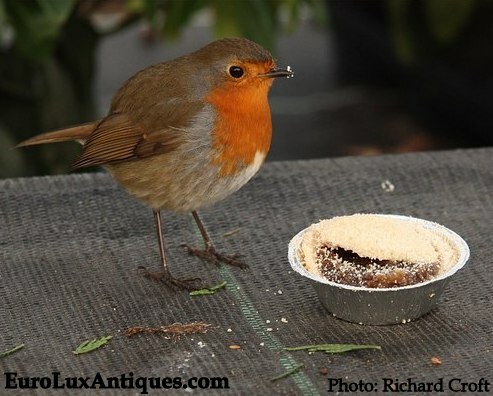 The photo of the robin taking a nibble of a mince pie is just so cute, but also the robin is symbolic of Christmas in England. You often see robins on Christmas cards there. European robins are much smaller than our American ones, and they have a deep red breast. Some say the robin’s red breast is associated with the blood of Christ. Others tell the nativity tale, where the night of the holy birth was so cold in the Bethlehem stable that Mother Mary asked the animals to help warm baby Jesus as the fire near the manger started to die out. Then Mary heard the flapping of wings and looked down to see a tiny plain brown bird fanning his wings at the fading embers, till the fire burst up brightly again to warm the Christ child. In the process, a flame burned the robin’s breast a vivid red, the color it has been ever since. Christmas crackers are also essential to English celebrations. They are ‘cracked’ before Christmas dinner begins, by one person pulling on each end. The cracker splits apart with a bang, and a trinket, a joke, and a paper hat fall out. You often see Christmas crackers in American stores now too. It’s important to realize that you don’t expect the joke to be very good. It’s usually some kind of groaner! 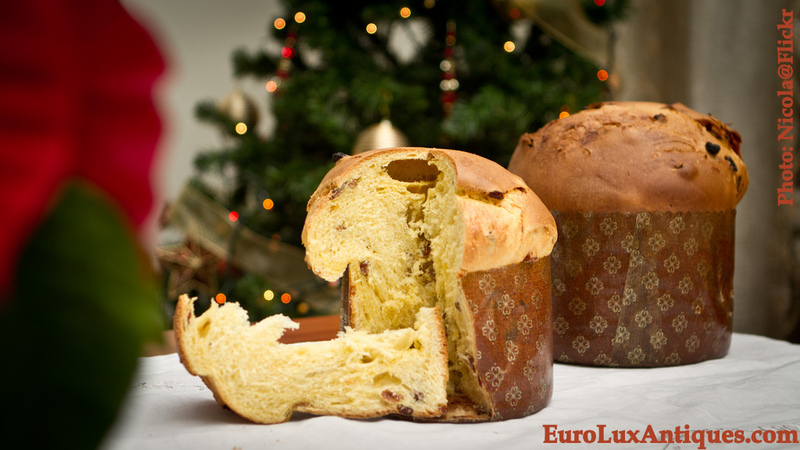 Panettone is one of the most delicious Italian Christmas treats. The light and fluffy sweetened fruit bread is shaped like a tall puffy chimney. It originated in Milan and some say its long history stretches back as far as Ancient Rome. Panettone appeared in a 16th century Bruegel painting, and was baked for emporers and popes! Panettone is tasty on its own, usually served with sweet wine or liqueur. You can also make a quick and sophisticated dessert dish by toasting slices of Panettone, and topping them with a fruit compote. Make a compote with frozen or fresh fruit cooked with a little sugar and water, plus some cornstarch to thicken the syrup if needed. Any fruit will work, but frozen mixed summer berries add a festive splash of color and the tart flavor complements the sweet bread. Pears poached in wine would be wonderful too! Then sprinkle some snowy confectioners sugar on top and add a dollop of whipped cream. 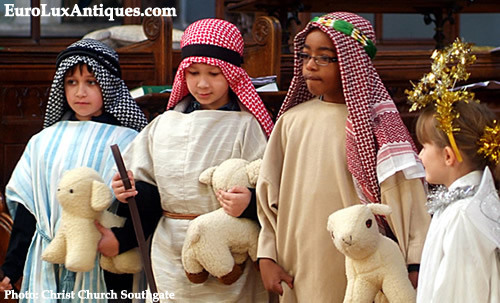 Another sweet Old World Christmas tradition: Italian children dress up head-to-toe as shepherds when they go carol-singing. Bless them! Then on Christmas Eve, Italian households bring out the Urn of Fate. The Urn of Fate is a large bowl that holds lots of small presents. Family members take it in turn to take their chance in a kind of lucky dip. Do you have any favorite Old World Christmas traditions that you enjoy in your family? Tell us about it in the comments box below. This entry was posted in Food, Holiday Fun and tagged Christmas, England, France, holiday, holiday cooking, holiday gifts, holidays, Italy on December 10, 2013 by admin. 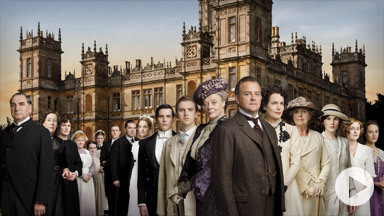 So many people are counting down to Downton Abbey’s return to PBS in America in January 2014. I could do a blog post on every room in Downton Abbey! Each one offers such visual delight and tons of inspiration for home decor. But I was fascinated by this article in Antique Trader that says people are clamoring for antique kitchen wares inspired by the Downton Abbey kitchen. To capture a taste of Downton Abbey kitchen style for your own home, look for old-fashioned utensils like meat grinders and rustic old pitchers. Fill chunky salt pots or salt cellars with large grain or rock salt. The materials are important too… brass, copper, wood, clay… these all give an authentic flavor to your decor. Copper creates the perfect accent for a Downton Abbey kitchen. The burnished glow and sturdiness of copper creates a unique sense of warmth. 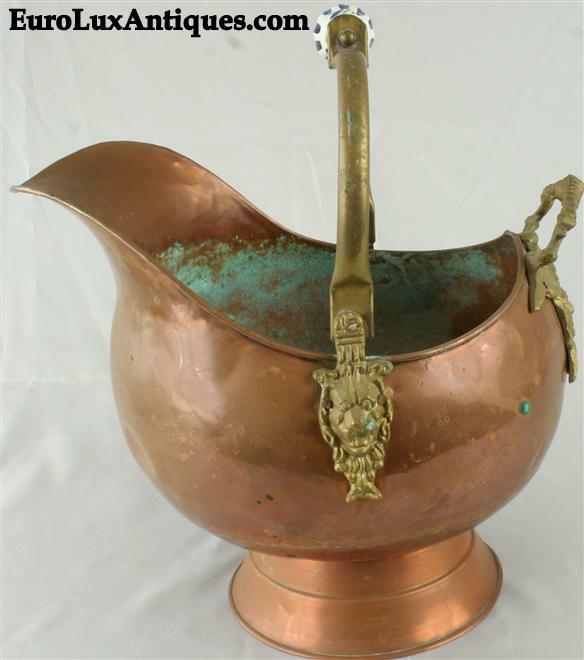 This vintage French copper scuttle in our gallery gives you an idea. It would make a terrific planter too, with the winged dragon detail on the side. 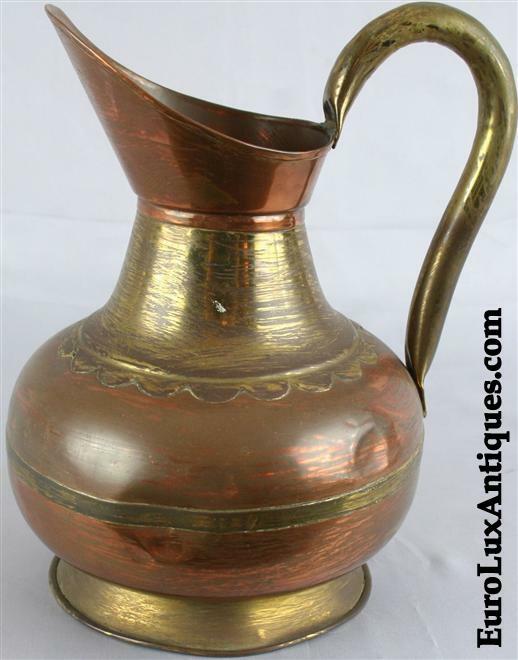 Display a few well-loved pitchers like this vintage copper and brass pitcher on your Downton Abbey kitchen table or shelves to add yet more Old World charm. The simple Country style and warm-hued metal is timeless, and the occasional small ding is part of the authentic allure. It proves that this long-ago crafted pitcher hasn’t just dropped off a shelf in a big box store, but has a history of its own. You can’t have a Downton Abbey kitchen without a genuine tea kettle. Those Brits are crazy for their tea, and with all that drama going on in the house, they need all the reviving tea they can get! In any case, a kettle always adds a welcoming note to kitchen decor. 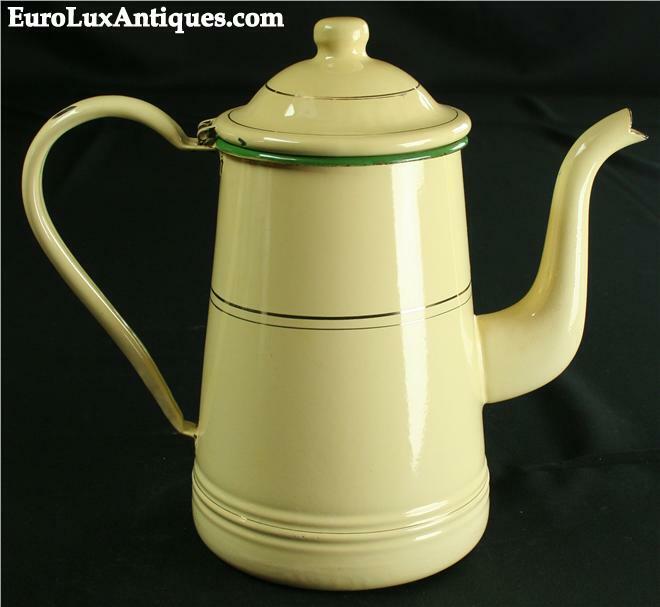 We found this 1920s enamelware kettle with gold stripes at an antiques market in France. Enamelware is always a good choice for an antique-style kitchen as it is so cozy and homey. 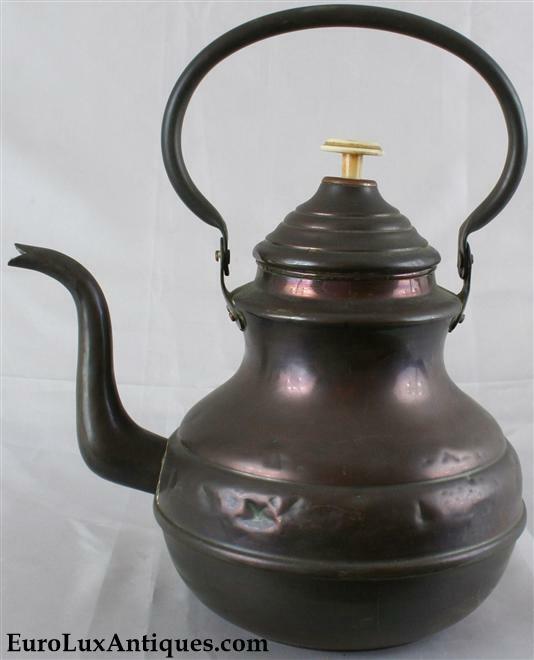 The charming antique French Country copper kettle below is more than a century old! It dates to 1900, and I wonder what stories it could tell about who has enjoyed the many cups of tea it has served from that pretty spout. Again, it has the genuine old-fashioned appeal to add a distinctive touch to someone’s Downton Abbey kitchen. I can just imagine Mrs. Patmore putting that tea kettle on the hob while she teaches Daisy how to make pie crust (they call it pastry in England) or gives Thomas a piece of her mind! Do you like the Downton Abbey kitchen style? 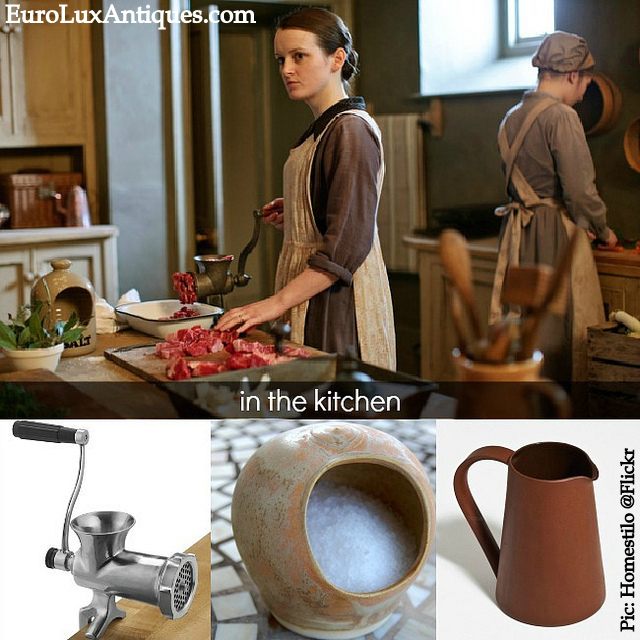 Are you especially inspired by antique kitchen wares? Perhaps you have an heirloom piece from your grandmother handed down that you still use today? Tell us about it in the comments box below. This entry was posted in Entertaining, Food, Home Design Ideas and tagged accessories, copper, Downton Abbey, French Antiques, home decor accessories, how to blend antiques into decor, interior decor, kettle, kitchen, living with antiques, vintage on December 6, 2013 by admin. Rick and Cheri J. enjoy visiting our little town of Newberry! They enjoy the laid-back atmosphere, small town charm, and our wonderful Newberry Opera House. They usually try to plan a weekend get-away to Newberry several times a year to catch a few shows and enjoy prime rib or shrimp and grits at one of our local restaurants, Cabana Cafe. 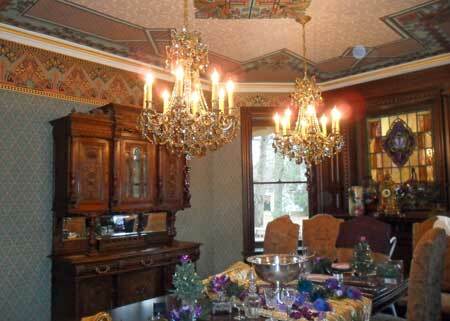 Of course, they also spend some time visiting our EuroLux Antiques gallery on Main street. Rick and Cheri have purchased quite a few pieces from us over the years. I love the fact that they have a strong sense of their own taste… they follow their hearts in choosing furniture for their home. They aren’t restricted by some idea that they must select pieces all in the same style. They do like antique carved pieces, but they are bold in mixing up styles to create a unique furniture fusion! Let me show you what I mean. 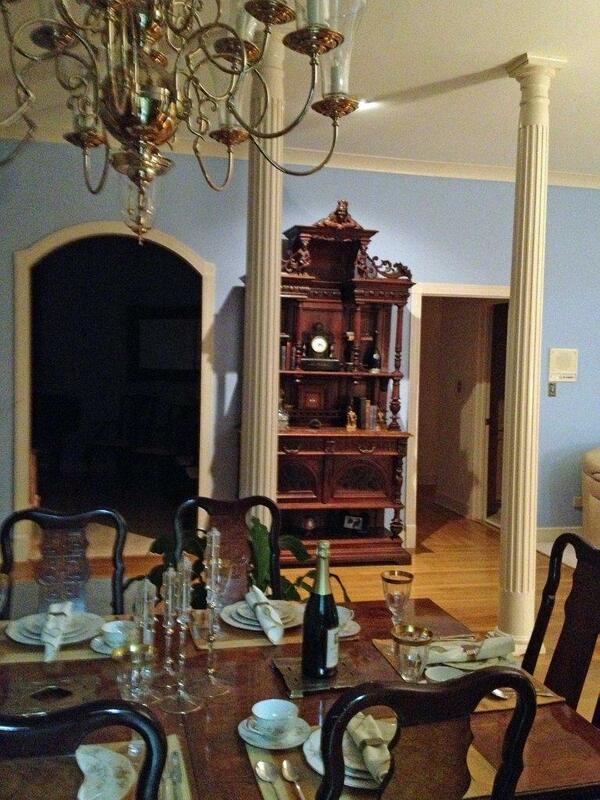 Rick and Cheri chose this beautiful 1900 French Renaissance buffet in walnut with a marble top. The antique carved buffet boasts whimsical jesters at the top. The buffet graces a wall adjacent to the dining table. Notice the table is set and is complete with a bottle of champagne! 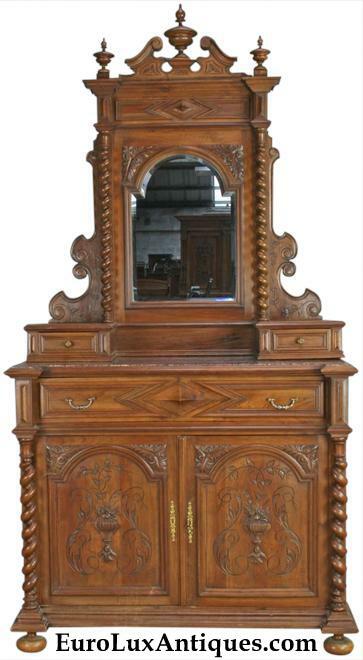 They also chose an antique carved Hunting style vanity for the bedroom. The 1880 French vanity table in walnut features barley twist legs, bun feet, and a lovely marble top. 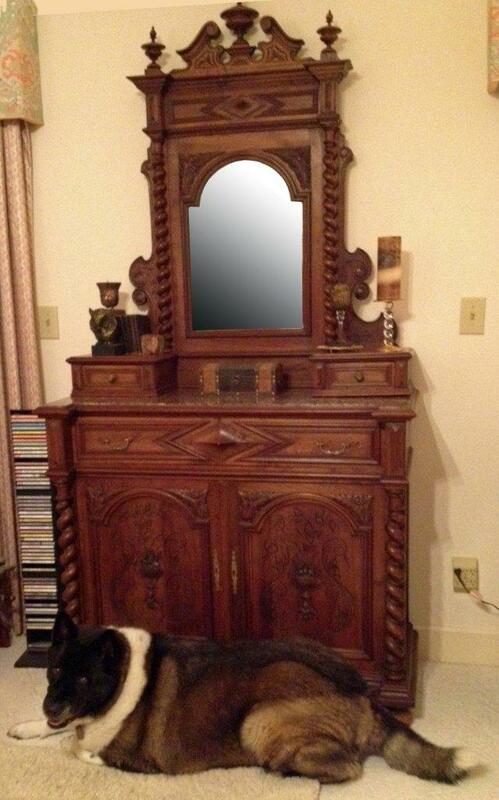 Their beloved Akita guards the vanity in its new home in Rick and Cheri’s bedroom! I can’t decide which is more gorgeous – the dog or the vanity! Together they make an adorable tableau. The couple also recently purchased a Flemish Renaissance Mechelen table. 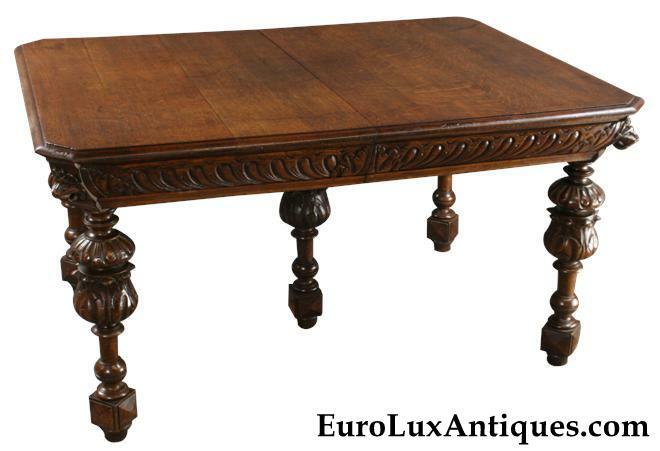 The antique carved oak table dates to 1900. Splendid carved lions’ heads keep watch from each corner, and the deep apron is adorned with a carved pattern to set off the floral design on the five nicely turned legs. Rick and Cheri plan to use the table as a desk, paired with this handsome Eastlake Chair that they bought from us. The very fine arrow-shaped silhouette on the crest rail is just one highlight of the antique carved walnut Eastlake chair. The chair was crafted in the USA circa 1900, and it is typical of the Eastlake style that was so popular in America in that era. Finally, although he wasn’t sure where it would go in their home yet, Rick picked out a chestnut nightstand in the Brittany style. The French nightstand features an enchanting red marble top. It’s rare to find such ornate decoration on the back rail, but this antique carved nightstand dating to 1880 has it all! Two figures of a man and a woman recline in a pastoral scene beneath trees, a farm house, and a windmill, and the door medallion contains a cameo of a dashing male figure. Although from around the same era, all these antique carved pieces are in different styles: Eastlake, Brittany, Renaissance, and Mechelen. And they all work brilliantly together in a fantastic furniture fusion! This entry was posted in Antique Furniture, Client Spotlight and tagged antique French Brittany, antique French furniture, Antique French Renaissance Henry II Style Buffet, antique Renaissance buffet, Brittany Antique Furniture, Eastlake, Eclectic, Heavily Carved Antique Furniture, Mechelen, Mechelen Style Antique Furniture on December 3, 2013 by admin.